How does one explain to a normal, sane, not-indoctrinated-into-the-sweet-potato-loving-cult-in-which-you-live, person that you’ve put sweet potatoes in their lasagna rolls? That orange vegetable consumption is a way of life around here? That yes, there are, in fact, more orange vegetables out there than just carrots? How soon is too soon to show the person you’re dating the shrine to orange vegetables you have oh so carefully nestled under your pillow? And what can you do, other than thank the heavens multiple, very profuse, times that said person, even though he is not sure that he even likes sweet potatoes in any form other than marshmallow-covered, digs in. With vim and vigor. And decides that, um yes. He’ll have thirds. …but I cooked a never-before-seen-or-made, totally original dish. That could have totally bombed. One is not supposed to take chances like that on fourth dates. That’s like…definitely a law in some states. But sometimes you have to have faith in your own abilities. In your own taste buds. In the power of the sweet potato! But did you really expect any less from the most nutritionally dense vegetable out there? I think not. Between good Friday night dates and fabulous half marathon Sundays. It’s been a pretty good week so far around here. Not to mention some fantastic news that I got yesterday…being that I WON THE SAUCY MAMA RECIPE CONTEST!!! Honestly, I couldn’t have done it without you and all your votes and support so thank you thank you thank you! And honestly, what I think it’s come down to is positive thinking. Believing that everything is going to be okay. Beyond okay. Great, even. I truly think that when you’re in a better frame of mind, you just make good things happen for yourself. It’s self-perpetuating. A domino effect. So let’s not only expect the best…let’s make it happen. Preheat oven to 350 and set a pot of salted water to boil. In the meantime, combine the garlic, basil, pine nuts, olive oil, and spinach in a food processor and blend until smooth. Add salt to taste. In a large bowl, mix together the ricotta, half of the mozzarella, parmesan cheese, and pesto that you just made. Poke sweet potatoes all over with a fork. Wrap each in a damp paper towel and microwave on high for 2 minutes per side or until fork-tender. Remove from microwave. When cool enough to touch, remove the skin and mash the sweet potato flesh in with the ricotta-pesto mix. To make it REALLY smooth, food process it until totally blended. Season to taste with salt and black pepper. 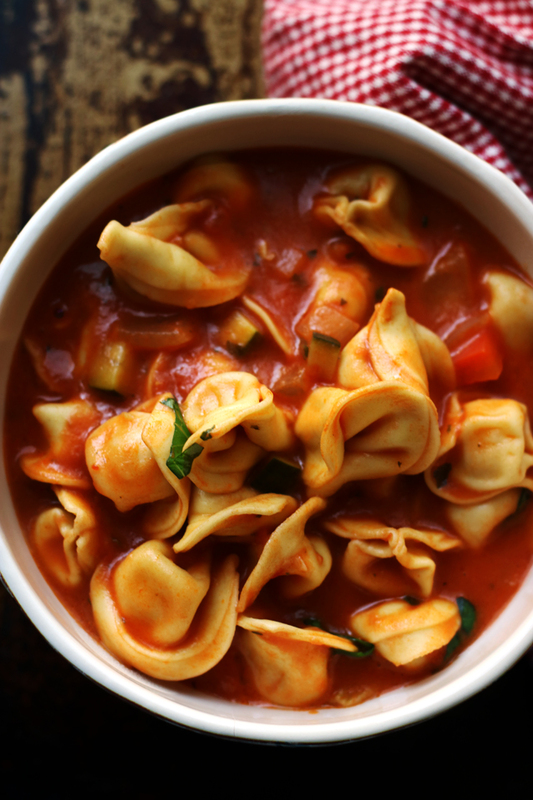 When water comes to a boil, add the lasagna noodles. Cook until just al dente. Line two large baking sheets with wax paper. Using a pair of tongs, remove the noodles from the cooking water one by one and place them next to each other on the cookie sheets. Spread 2-3 tbsp of sweet potato-ricotta filling on each noodle. Beginning at one end, loosely roll each sheet. Spread 3/4 cup of the tomato sauce onto the bottom of a 9×13-inch baking pan. Place the rolls, seam side down, into the baking pan, fitting them as snugly against each other as possible. Top with the remaining tomato sauce and mozzarella. Cover pan with aluminum foil and bake for 30 minutes. Remove foil and bake for 15 minutes or until cheese starts to brown. Let cool for about 5 minutes before serving. I am submitting this to Presto Pasta Nights, which is being hosted this week by Juli of Pictures of all my Princesses. This dish will be entered in the North Carolina Sweet Potato Commission‘s No More ‘Mallows Recipe Contest. Because sweet potatoes aren’t just for sugary casseroles anymore. Ooh, now that looks really good. I don’t use sweet potatoes enough. They just don’t grow them at our CSA farm. I should buy them more often. Thirds? You need to marry this man! 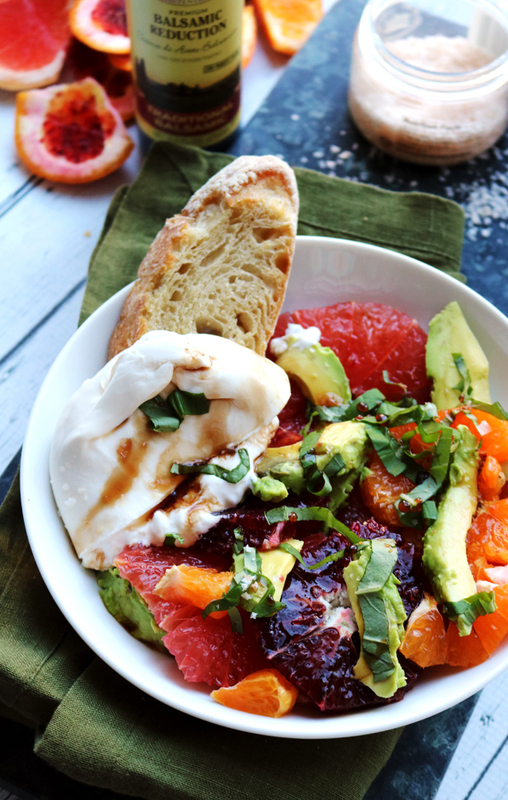 Though I probably would have devoured the entire dish.. seriously this sounds amazing! Congrats again on your recipe win!!! Wow, insanely good news all around. Congrats Joanne!! I love anything sweet potato. This looks fantastic. Dear. Freaking. Goodness. This looks unbelievable!! Awesome! Congratulations on the contest win. 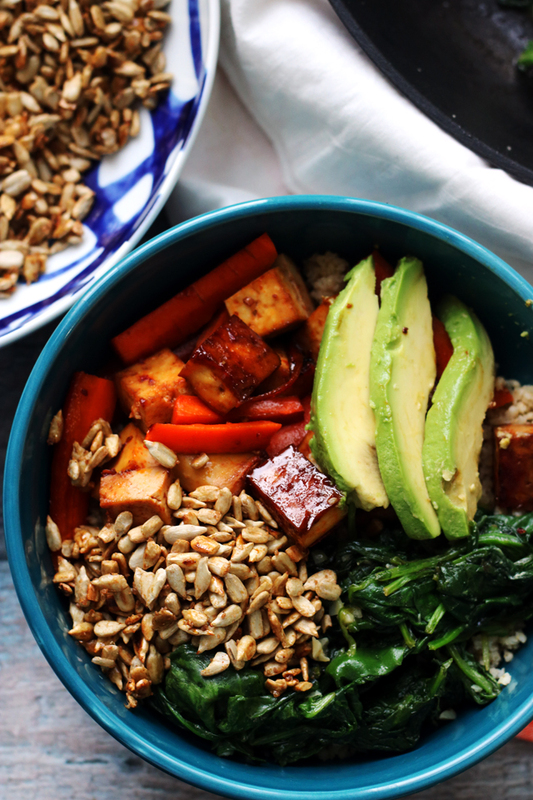 I love this dish as it looks and sounds delicious and healthy. As much as you use orange veggies, I’m not surprized you dared to try it on a 4th date or that you pulled it off. Also drooling! And congrats on winning the contest! You are some sort of genius, I tell ya. I’m so making this! Gotta admit, I’ll probably add some sort of meat to keep the carnivores around here happy, but this looks insanely good. And congrats!! YAY! omg where do i even start! first, congrats on the win! I am SO excited for you, you totes deserve it! second, YAY for 4th date! can’t wait to hear more about it. wooooooooooooooooooooooooooooooooooooooooooooooooooooooooooooooooooo. can you imagine me dancing when I did that too? because I did. third, that lasagna looks sooo ooober good. like it’s making me consider leaving work ‘sick’ so i can go home and make it. and eat it at 9 am. First I want to say congratulations for winning the contest! That is so awesome! Great job, I’m proud of you! Woohoo!!! Secondly, this dish looks fantastic and I mean fantastic! I love pest and I love sweet potato’s, this dish, muah, look amazing!! Congrats on winning – although I’m not surprised. Everything you make looks gorgeous and tastes delicious. Thanks for sharing this wonder with Presto Pasta Nights. And what are you serving for date night #5? Bet your sweet potato rolls you won, girl! Awesomesauce!! More importantly, “…show the person you’re dating…” HEE. Congratulations on winning but my brain is screaming sweet potato and spinach pesto lasagna??? love it! ooh we definitely are on the same page this week. Although, I’d say your lasagna rolls have my stuffed shells beat. Congrats on the win! Congratulations! This one looks great too – I love sweet potatoes and could eat them everyday. Hubby isnt a huge fan but I bet stuffed in a lasagna sheet he would love it! And congrats on yet another awesome recipe. This is going in my list of indulgent meals. 🙂 Can’t wait to try it! I am really loving this dish. In the last year, I have signed up and am now a proud member of the sweet potato fan club. Look amazing!! I love these cheese! Im hungry now! I love sweet potatoes, and I want these for lunch today! Oooh! So happy to know that the date turned out great. Who wouldn’t fall in love with you with that recipe? This is a must-try! I love lasagna very much, although I don’t get to make them very often because they are time consuming! These rolls are sooo good! I would devour them in a minute! Oh I like this one alot! Congrats on the win too!! Sounds absolutely perfect to me. What a great combination. These look fantastic! I’m not totally on the sweet potato train yet either, but I know they’re somewhat of a super food and I should utilize them more. This seems like a great sub for ricotta too! Your post cracked me up. 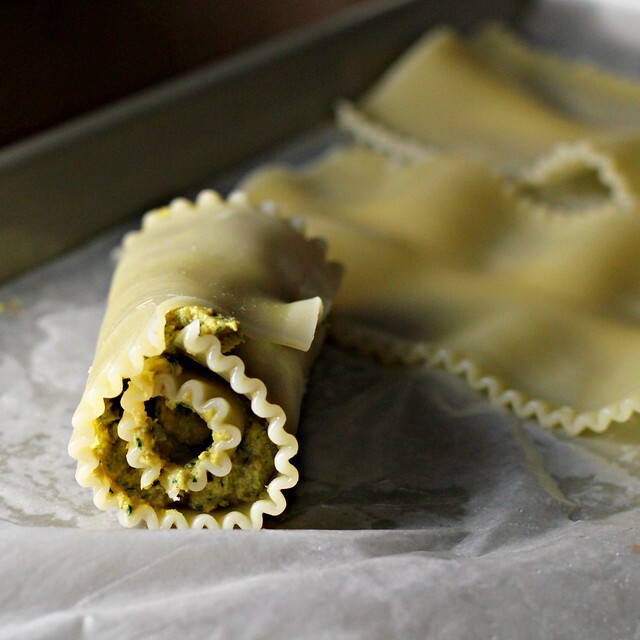 I think it is a great idea to roll up those lasagna sheets and I am already making notes. Hubby is a big fan of lasagna and so am I. 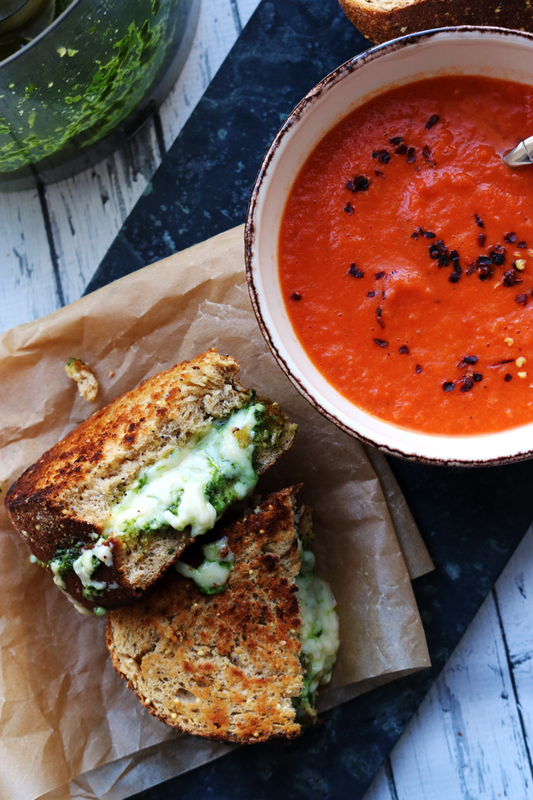 Anything is possible with sweet potato and pesto involved. And the fourth date! Where the heck have I been?! Oh yeah, fixing my camper. But thankfully I’m almost done so I should have more time to visit soon! Congrats on: the fourth date, making a dish for the first time that didn’t bomb, sneaking in a sweet potato, AND WINNING THE CONTEST! You rock, girlfriend. 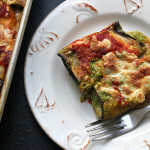 Love the lasagna–never would have guessed there was a sweet potato in it! p.s. Good job on winning !! I am loving these rolls! I have sweet potatoes, and pesto from last summer in the freezer-I know what I’m making!! Also, I find this terribly amusing. My boyfriend, Eric, is convinced he hates sweet potatoes but loves squash. so I tell him that whatever he’s eating has squash in it, and invariably declares it to be the best tasting squash ever. But he still hates sweet potatoes. Who will ever understand men? not me! sweet potatoes in lasagna is such a creative idea! this looks fantastic, bookmarking it! The recipe looks yummy, but it was the little saying in the box that was valuable today. My 15 year old daughter was stressed this morning – end of the quarter tests, softball tryouts, AAU basketball tryouts, band concert…and on and on this week. I sent a copy of the saying to her and got a very nice thank you and love you in response. This is definitely a winner in my book. I know I would love this. So original too!!! I believe in karma…what you give out you get back…..
Hooray for a great week! No surprise this dish was well-received. It looks amazing! So, show him the shrine to orange vegetables on the fifth date? Darnit!! I wish I hadn’t started dinner already. These look INCREDIBLE. I love sweet potatoes, pesto and lasagna. I can see this becoming part of the permanent dinner rotation. Thanks, Joanne! Gorgeous! I need to get myself some sweet potatoes and lasagna now! I’m now cursing the fact that I never keep lasagna sheets on hand, since I almost never make lasagna. These rolls are such an elegant, and mouth-watering solution! Love everything about these. yay for fourth dates, positive thinking and sweet potatoes! and a special woot woot to your imagination. sweet potatoes and pasta? who would have thunk it? Love hearing your dates are going well. 🙂 Congratulations on your contest win and good luck for this one! I have pinned this for future reference because I NEED to taste these flavors together. Good luck on your entries! Congrats on winning the Saucy Mama contest!!! And on the fourth date and *hopefully kiss-worthy meal 😉 Looks delicious. 4th date!?! This looks perfect for it 😉 It’s saucy, the colour looks so appealing.. I want some!! ps- congrats on your win!! Congrats on winning The Saucy Mama Contest!!! You totally deserve it 🙂 And I cannot wait to try this. I loooooove sweet potatoes. I’ve been eating the purple and yellow varieties in Japan every day for breakfast and I cannot get enough of them. 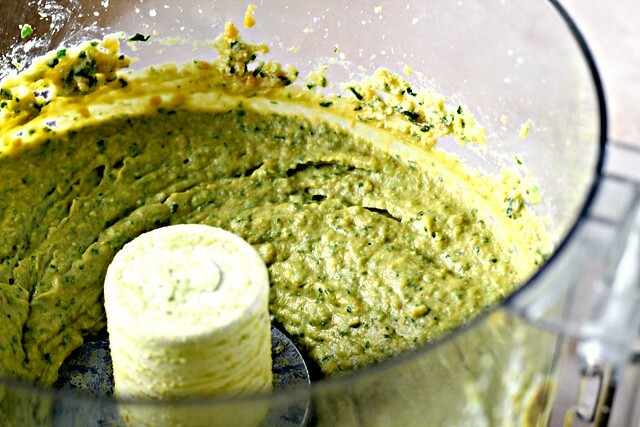 I’ve never thought about using them in pesto–genius! here in Australia, we eat sweet potatos all the time, baked, mashed, as chips, in curries, stews and soups… the list goes on! They are pretty much a ‘staple’ vege, and I found it so odd when i heard you guys like to put marshmellows on top!!! 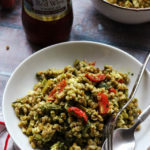 Anyways, this recipe looks fantastic and i cant wait to try it! I’m loving this domino effect Joanne! You totally deserved to win the Saucy Mama Contest! 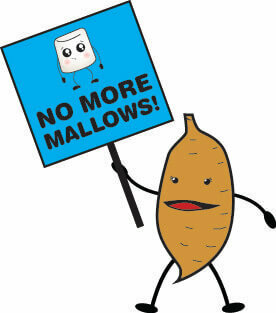 I eat sweet potatoes all the time, and never with marshmallows! I don’t really like marshmallows actually (except if a campfire and a stick is involved). Your recipe look great – congratulations on winning the contest, too! Ok, you finally “got” me. Sweet potatoes are on my “no thank you” at Thanksgiving list and any other time of the year. BTW there aren’t many things I won’t eat (okay, maybe fried chicken feet). Honestly can say this looks like it would taste delicious. Congratulations on date #4, the new recipe and winning the Saucy Mama contest!!! Congrats on the contest! I’m so happy for you! Your sweet potato rolls look incredibly good – it’s no surprise he had thirds! I need some of your positive thinking – I’m feeling very uninspired lately. Good for you for taking chances! I’m glad to hear the fourth date went well. And that you convinced him that sweet potatoes are worth trying. This looks divine. Congrats on the Saucy Mama contest! And these lasagna rolls sound really good. I would never think to put sweet potato in lasagna but it definitely looks like it works. And man, this guy sounds adventurous. I remember making this pork and sweet potato dish when Jeff and I first started dating… before I knew about all his food quirks… he didn’t touch the sweet potatoes! First, congrats on the win! Yay! Second, these look really fabulous. As a person who formerly was NOT a member of the sweet potato cult, I can only wish that my husband would have made these for me when we dated, so it didn’t take me years and years to realize the awesomeness of the sweet potato. I love the idea of lasagne rolls. Thirds….you guys are a match for sure! I hope this man realizes what he’s got– smart, funny, sassy and one helluva cook/baker. I can’t wait to hear the rest of the story. Sweet potatoes. Boiled. Baked. Fried. Mashed. It’s a good, but this one is a few notches better. Nice! Fourth date huh? Better than the third date guy I am assuming! Is this one a keeper? If so, I am so excited for you. So did you make this lasagna in front of him and photograph it too? If he sat by patiently why you did that then DON’T LET HIM GO! My guy waits for his food to be photographed with no complaints – he’s a keeper I tell ya! Congrats on the win AND on that fourth date. 🙂 This looks like a fantastically flavorful dish too. I want to know if he sat and watched while you photographed it as well. That is a GREAT quality in a man as well. Have a blessed week! Congrats darling.I’m so happy to hear that you won. 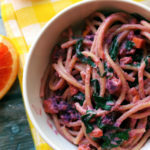 What an ingenious way of incorporating the sweet potato into a pasta. Brill! It’s funny – I consider sweet potatoes and butternut squash interchangeable in a lot of respects, and butternut squash in lasagna seems like a natural thing. sounds like a great combination of sweet and savory. plus, the guy seems to have passed the taste test :-)! I would have dug in even on the first dat. Any man I dated, and was cooking for me, would know that I have an adventurous spirit! Wow…this is so good and your pictures too…. congrats on the victory and the creation of some fantastic lasagna rolls! Wow, this looks simply amazing!! Sadly, I have only had dishes with sweet potato in them at most 3 times in my lifetime. And I think that everytime it was sweet potato fries. Never knew they could be so versatile. These look great! Congrats on the recipe contest!! These lasagna rolls also look prize-worthy! This is my very favorite dish you have ever made here Joanne. I am blown away by how delicious it looks, the fact that you just “whipped it up” and the flavor profile seems very earthy and complex and wonderful.So glad the date went well too. I totally agree that a positive attitude can have positive effects, however my own head gets in the way with my belief in that. Yes that was some risky business there, use an experimental recipe on the fourth date! I’m impressed! I just wanted to tell you congratulations and I have never, ever liked sweet potatoes with marmallows on it or any added sweetness for that matter. I never understood why you needed to add sugar to something that was naturally sweet. I would offer to bring the sweet potatoe dishes to holiday dinners just so I wouldn’t have a sweet sweet potato dish, with marmallows…yuck!! Yay for dating! Yeah… I think it was around the 4th date that I made Eric hummus pasta. That was my go to recipe back then. Oh how things have changed. 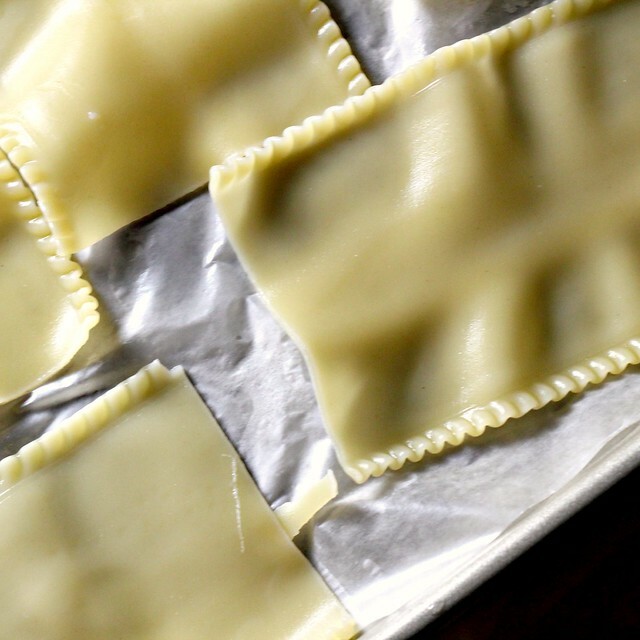 Great post and this is just what I’m going to make when I get my act together and whip up some homemade pasta again. I have made a dish with spinach and sweet potato and I remember it being a huge success. That interprets into this also being successful This is for after Passover, though. I just realized this is baked. If you have a moment, please link it to Bake with Bizzy. I am getting people to realize it is also for savory, not just sweet and it is fun, seeing these baked delights. Congratulations on everything! This was a great week for you. 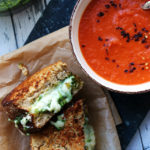 This looks so amazing…I wish I could have a bite right now! Beautiful photography! I could definitely get into this one. sounds delicious. Though, I must confess, I have been busily whipping up some flavored, homemade marshmallows. Not that I would top sweet potatoes with them. Congrats on winning as well as the date!! Congrats on the recipe contest!! And this looks delicious, I can see why he went back for thirds. 🙂 I firmly believe that sweet potato makes everything better. Congrats on the hot – rule breaking – date! These lasagna rolls look superb, they don’t even make me think “vegetarian”. Glad the beau was impressed and stayed around for thirds. 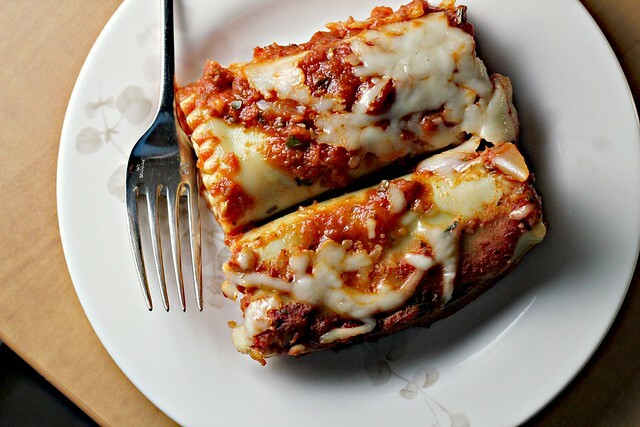 Oh my, these lasagna rolls look amazing! So glad to hear you had a good week and congrats on winning the recipe contest! Congratulations!!! Uhm yes…I would have had three man sized servings of this too! Looks incredible. Just made these for dinner tonight. I have a not-so-secret obsession with sweet potato, so I had to give them a try. They came out fantastic!! Keep the inspiration coming! These sound like some really tasty lasagna rolls! Yum! These are high on my list of things to make. I’m not the biggest sweet potato fan, but these look delicious – and I’m glad the 4th date went well! Congrats on the contest! If someone made this dish for me on a date I would ask to marry them immmediately. First of all, congrats!!! Second of all, we MUST catch up stat because you’re going out on FOURTH dates and I don’t even know anything about this guy? 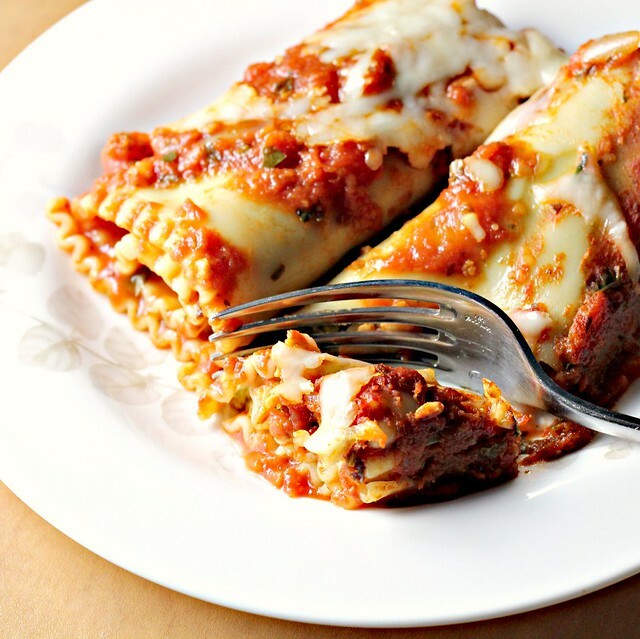 Lucky for him, you’re an awesome cook, and these lasagna rolls are FAB! I saw that you won, and was so happy for you! 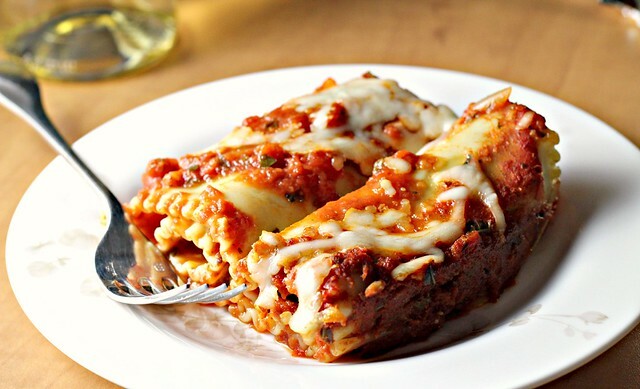 This lasagna is so something that I’d totally dig into. Loving it!! some amazing things going on over there in that apartment 😉 this looks incredible. i haven’t quite put the sweet potato and pesto idea together yet, so I’m intrigued. and i’m glad he liked it! I made this tonight to use up some sweet potatoes in my CSA and I made a meaty version for my boyfriend – he LOVED it. He hates spinach and sweet potatoes and he ate 3/4 of his pan of lasagna. He knew there was spinach in it but agreed to eat it b/c is was pureed with cheese. After he cleaned his plate of the 2nd helping I asked if he could taste the spinach and he said no, then I asked if he could taste the sweet potato and he looked at me all frowny and asked if I was joking. I showed him the recipe and he was impressed! AWESOME. This is a winner in my book. made this last night. SO GOOD! even my sweet potato hatin’ husband loved it! 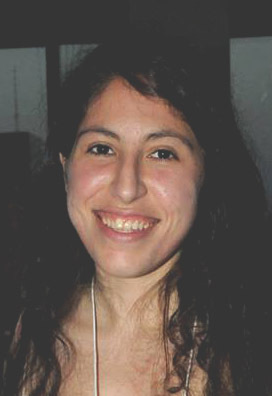 Ok, your blog is like my soul sister! I literally want to eat every single dish! Hi can you use already prepared pesto? If so how much? and how much does 4 sweet potatoes mashed make, measuring cup wise? Yes, you can totally use prepared pesto! I would start with 1/3 cup and then add more to taste, if you want! 4 sweet potatoes mashed should be about 2 1/2-3 cups!